A property owner ends contracts with oil drilling company to use his Rochester Hills parcels for oil and gas drilling operations. 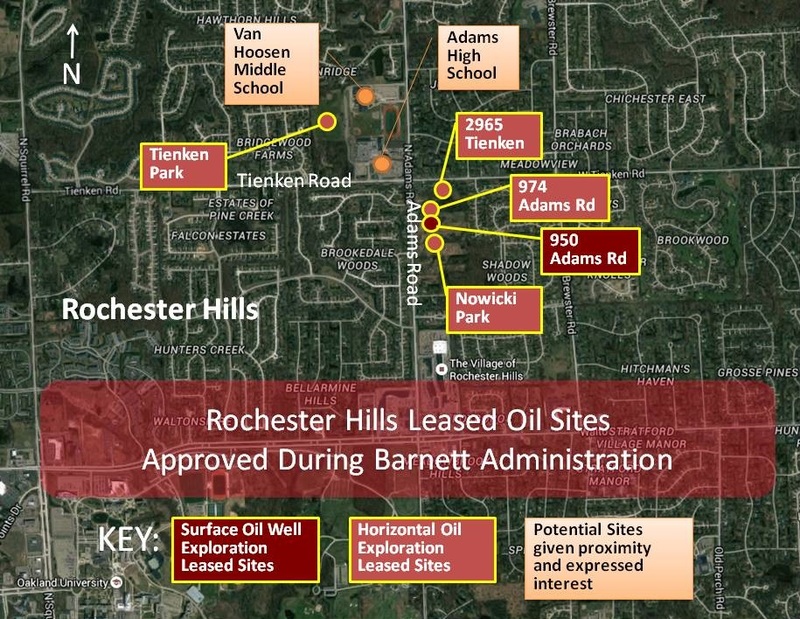 In what appears to be a small victory for Rochester Hills residents, the oil and gas exploration company filed a ‘Release of Oil and Gas Lease’ for three parcels located at the corner of Adams and Tienken roads. The drilling contracts were first revealed by Don’t Drill The Hills in October of 2015 after continued denial from the mayor and city officials that any lease allowing surface activity existed in the City. 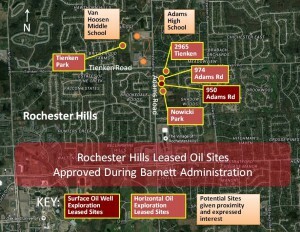 The properties are adjacent to one of the Rochester Hills parks Mayor Barnett leased for oil and gas exploration without seeking a vote of the residents as the City Charter requires. The more than 6 acres of residential zoned property is owned by a Troy, MI couple. The contract with West Bay Exploration would have allowed surface oil wells and related industrial operations next to homes and 2 schools. The reason for the reversal of the contract is unknown, but the outcry from residents, public awareness and pressure likely played a part. 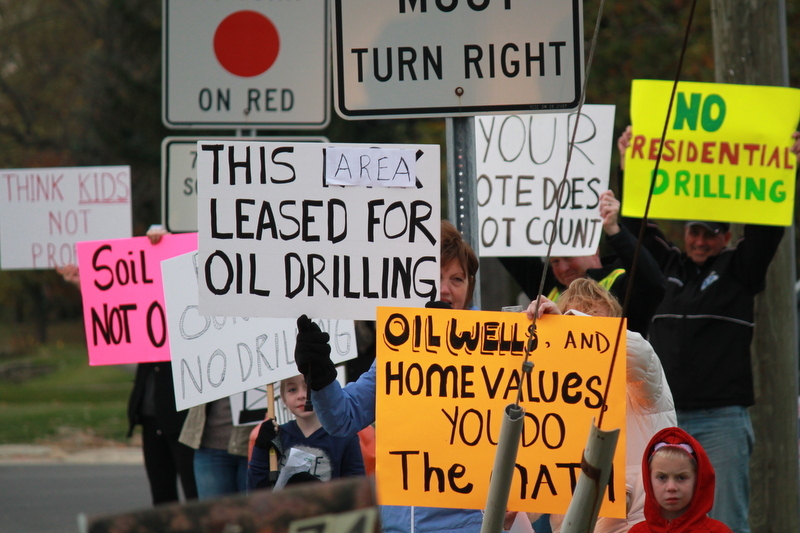 In Shelby Township, a surface oil and gas well was erected in a high density residential area which prompted an outcry from local residents and much negative publicity. The well on the Nino Homes property was eventually removed and a ‘Release of Oil and Gas Lease’ was recorded in August 2015. Again, the residents who spoke out and protested should take credit. 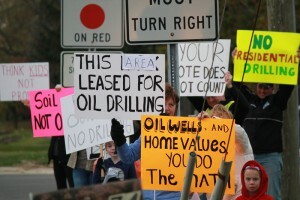 In Rochester Hills, as with the rest of Oakland County, the threat of oil and gas drilling in residential areas still exists. The Rochester Hills parks are still leased to Jordan Exploration. 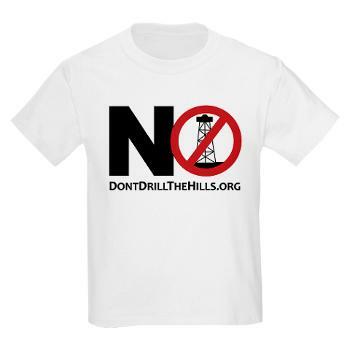 Don’t Drill the Hills has sued the City of Rochester Hills and Jordan Exploration for leasing the City properties without seeking a vote of the residents as the City Charter requires. The voting rights lawsuit continues at the Michigan Court of Appeals. Jordan Exploration has stated that they “don’t have any intentions” for “activity in your area.” Statements of “intentions” from any oil & gas company are not legally binding. Now months later, Jordan is seeking a permit to drill in another Oakland County city, Southfield. This clearly demonstrates that they do have intentions to continue pursuing residential areas for oil and gas exploration. The remedy for existing leases in Rochester Hills and Southfield must be in the form of a legally binding “Release of Oil and Gas Lease” document filed with the County Clerk. Until the contracts are legally voided, the risks of oil exploration in high density residential and school areas remain, and so do the legitimate concerns of residents. Public and political pressure has, for now, kept oil and gas drilling out of our high density residential areas. The citizens must continue to be vigilant. Write to your Mayor, Representative, and Governor. Let them know where your stand with respect to oil and gas exploration of any form in residential areas.